Today the world is on the threshold of population explosion. With the increasing population, the rate of consumption of the resources too will increase in leaps and bounds. 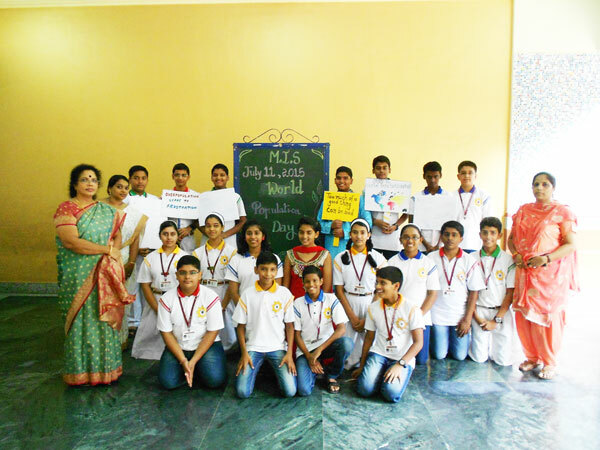 Hence to make the students aware of the menace of over population, Mahatma International School organized an awareness programme on World Population Day, i.e. 11th July, 2105. "A large population becomes an asset only when the people become a resource." She added saying that population is increasing geometrically which may cause chaos and starvation in future. She heartily congratulated the class teachers of Std. IX and X, Mrs. Deepa Jayaroy and Mrs. Meena Khalil for organizing the programme successfully. The programme concluded with a Vote of Thanks conveyed by Smriti Iyer of Std. IX. The programme was highly appreciated by all the teachers and students alike as it sensitized all towards the peril of over population.